"Some men are coming to kill us... we're going to kill them first." 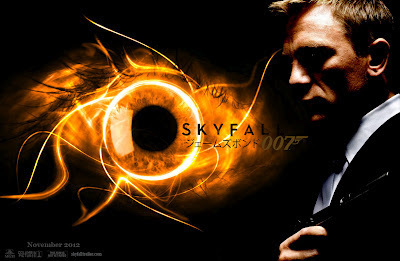 Columbia Pictures finally released their first teaser to the long awaited Jame Bond movie, Skyfall, the 23rd Bond film and third to star Daniel Craig as Agent 007 (following Casino Royale and Quantum of Solace). This is just an early tease, so it doesn't reveal too much (which I like), but it still gives you a taste of what's yet to come. And man, does it taste sweet. It's a perfect teaser, I think. It's intriguing, thrilling and badass. Take and look and enjoy! Skyfall is directed by Sam Mendes (American Beauty, Road to Perdition, Jarhead, Revolutionary Road, Away We Go), from a script by Robert Wade, John Logan and Neal Purvis. Helen McCrory and Ola Rapace will appear in Skyfall, joining previously announced stars Daniel Craig as James Bond 007, Javier Bardem, Dame Judi Dench as M, Ralph Fiennes (love him), Albert Finney, Naomie Harris, Bérénice Marlohe, with Ben Whishaw. Talk about a great cast! You can expect to see 007 hit theaters on November 9th 2012.